Not A Good Day, Good Day! In all honesty, I woke to a migraine in my head and my body 😀 (trying to recuperate from days of constantly moving furniture and such)! Our days around here lately have been kind of crazzzyyyyy!!!! And, those crazy days of dealing with people and situations can really begin to take a toll on you. Today, I’m feeling it. No holds bar! I’m not holding anything back. I am still going to search for the good in this day. I am still going to look for a reason to smile. I am still going to work on me as necessary. I am still going to love. I am still going to claim the peace of God. I am still going to pray, knowing that He always hears me. I am still going to do a good work. I am still going to believe the best in everything this day has to offer! I have determined that that is how I will finally see the good in my day. Me reaching my destination is important, but the drive there will tell me if the journey was pleasant or not. I intend on enjoying the journey of today. Declare today that bitterness, strife, and contentions have no place in the passenger seat with me. I am buckled up in Jesus and ready to go! Grant Us Boldness to Speak Your Word! Your Faith Speaks more than Your Words! So, the old phrase still rings true today: “Seeing is believing.” To a world lost, who have not hope, they look for a ring of hope they can grab onto to prevent them from drowning in the deep abyss of the darkness of this world. They want a way out. Many don’t want to sink deeper into despair, deeper into the unknown where there is no light to guide the way. They want to see what you say you see. They want to feel what you say you feel. They want what you say you have but do they see it currently active in you to propel them from wanting it to seeking it? Your faith speaks louder than your words. 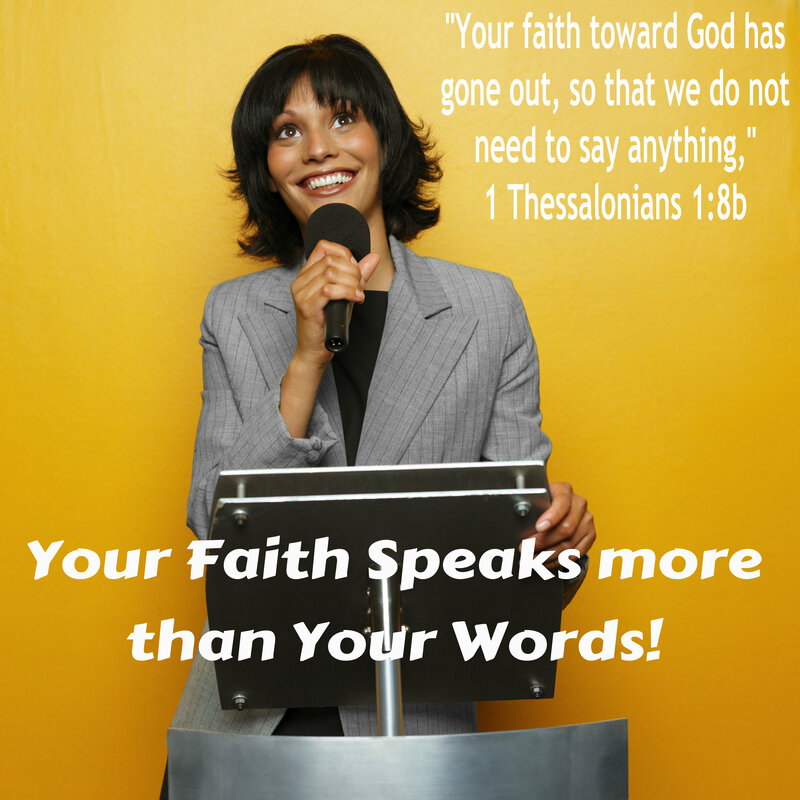 Paul told the church at Thessalonica, “Your faith toward God has gone out, so that we do not need to say anything,” 1 Thessalonians 1:8b, NKJV. If necessary I believe Paul would have testified on their behalf, he would have spoken up for them to assure others of their faith. But, their faith was so active, their faith was so alive and in operation that he didn’t feel a need to speak at all. Their faith did the talking for them. Their faith is what people noticed, not the words they spoke from their mouth. A lot of people do a lot of talking these days and sometimes it’s hard to decipher truth from fiction. Jesus gave us a key that lines right up with what Paul wrote in his letter. Jesus said, “Ye shall know them by their fruits,” Matthew 7:16. If one comes upon a tree that has apples growing upon it then they are to assume it is an apple tree. The same is true with a life of faith. What they see coming out of you, or as Paul referred to as “gone out” is what matters the most. You can say that you are an orange tree but if I see apples then I will classify you as an apple tree. If you say that you have great faith but all I see is the opposite than I will not view you as having great faith. I will mark you by what I see. Your faith matters in this world. More importantly, your faith on display matters to those around you so much that one should not have to speak up or testify for you, all they should be able to do is look at your faith in action and mark you as a person of faith. Your faith speaks more than your words! Be blessed. What would it be like to sit across from Jesus, face to face, and have Him question your trust? Would we be able to look Him in the eye as we pondered our answer? Would our heads be bowed, feeling unworthy to lift it and look into the eyes of love pleading with us to believe? What would be like? I imagine it would be self-revealing because in those questions we find where our hearts and our true belief lies. It reveals where we really stand in our faith. I have never read or heard of anyone, anywhere who tries so hard to get people to believe in him, for their own good, outside of Christ. Who had pleaded with man through the pages of history to trust Him with their life and everything it entails. Who has welcomed the problems and prayers of others into His own person to carry so that we don’t have to. Face to face. Pleading eyes. Questioning trust. In Luke 18, that is what I see playing out. Jesus is telling a parable of a widow woman who just will not give up seeking justice. Day after day she sought the judge and became a downright pest about it. In her perseverance she basically wore the man down until she was avenged. Jesus used this parable to get the point of persistent prayer across. And he spake a parable unto them to this end, that men ought always to pray, and not faint,” (Luke 18:1, KJV). Jesus knew that men and women everywhere would have to believe that if they continually seek the Father, He hears them. “Hitherto have ye asked nothing in my name: ask, and ye shall receive, that your joy may be full,” (John 16:24, KJV). “Nevertheless when the Son of man cometh, shall he find faith on the earth?” Jesus questions trust. He questions whether or not anyone will believe in the promise and power of prayer. He questions if there is real, alive faith working in mankind somewhere. He questions. One’s faith lies at the center of this questioning, for if we really believed wholeheartedly, there would be no hinderance to bring every request and problem before God in prayer. This is what Jesus is getting at. True faith unencumbered. True faith that takes the shackles off of God’s promises and allows one to run freely forth, believing He hears, He knows and He will answer. Bringing out the faith of people was key in Jesus’ ministry. 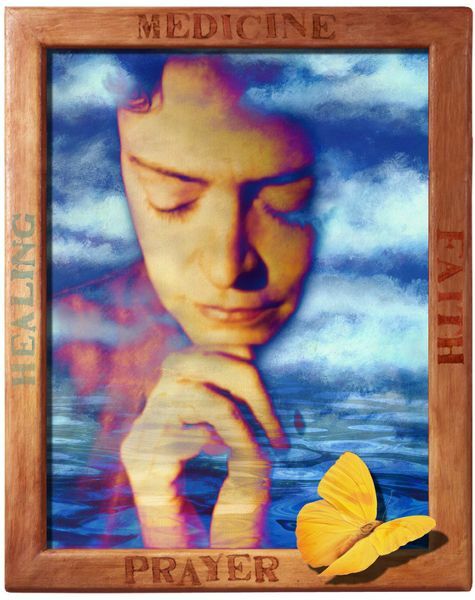 How often had He declared that it was by faith one was healed? In the story of the Ten Lepers, to the one who came back to “give glory to God,” (Luke 17:18, KJV), He said, “Arise, go thy way: thy faith hath made thee whole,” (Luke 17:19, KJV). How much are we missing out on through our lack of faith? Jesus is questioning us, will we have the faith to respond? Do we trust HIm enough to bring all our cares, problems and issues before Him, laying them at His feet? “Thou shalt call, and the LORD shall answer; thou shalt cry, and he shall say, Here I am . . .,” (Is. 58:9, KJV). “Here I am.” God is not far off. When we venture to trust Him enough to cry out in the midst of our mess, He responds, “Here I am.” The word “here” indicates a present closeness. “I am” is the name God gave Moses to assure those in Egypt, Ex. 3:14. Whatever they needed God to be, “I am” has got it all under control because He is God all by Himself. He does not exist because of another. He does not depend upon another. His power is not contingent upon another. He is “I am!” And I am says, “Here I am!” Can’t we trust Him? Faith and prayer go hand in hand. “But without faith it is impossible to please him: for he that cometh to God must believe that he is, and that he is a rewarder of them that diligently seek him,” (Heb. 11:6, KJV). 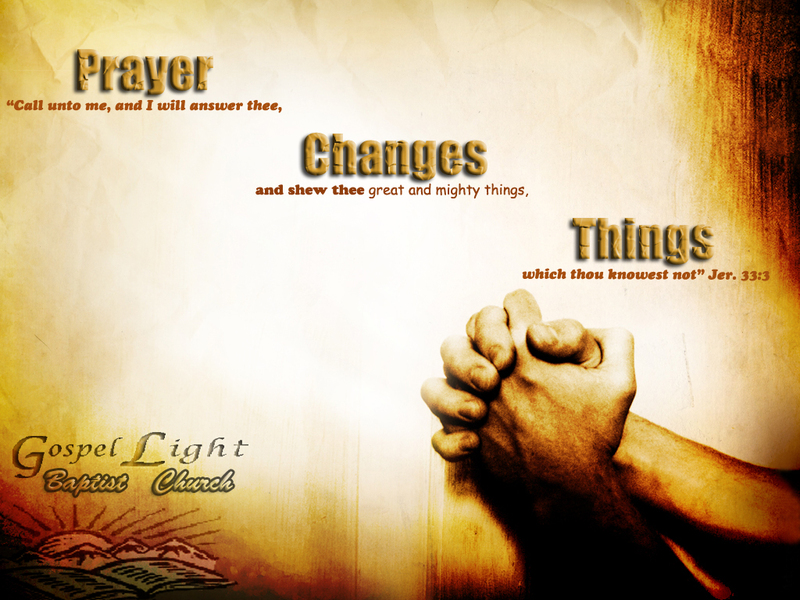 Without established trust in Him and in His promises we are unable to effectively move God with our prayers. We are unable to please Him. Why? Because without that leading trust, the basic requirements of faith cannot be filled. “He that cometh to God must believe that he is, and that he is a rewarder of them that diligently seek him.” They must believe in His existence (previous paragraph) and they must believe that He is concerned enough to hear the call of them that cry out to him, and answer them. Trust. “Shall he find faith on earth?” Our faith and trust in Him is the key that unlocks the door to victory. “For whatsoever is born of God overcometh the world: and this is the victory that overcometh the world, even our faith,” (1 John 5:4, KJV). Will there be some that really believe? The reason for this parable was to teach men not to give up – to keep praying and believing that God hears and that He is able to take care of it all. Do we trust Him enough to let it go and give it to God today? You may have to come every day and lay it on the altar of prayer – so be it. That’s how the widow got her case heard. In this questioning of trust Jesus is also demonstrating an open invitation for us to lay every hinderance down before God in prayer. Prayer works! Persistent prayer works! 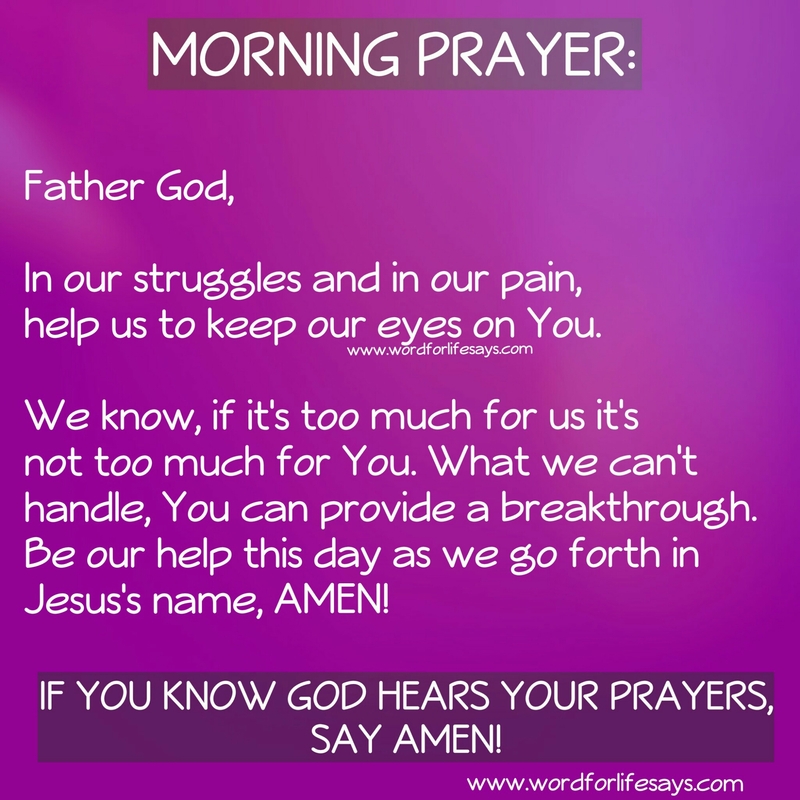 Persistent prayer plus faith works! The pleading Savior is asking us to trust. “And so Betsie and I arrived in Barracks 8 in the small hours of that morning, brining not only the Bible, but a new knowledge of the power of Him whose story it was,” Corrie Ten Boom, The Hiding Place, p. 214, Hendrickson Publishers, Copyright 1971, 1984, 2006. The above quote was written after Betsie and Corrie were able to smuggle a Bible in one of the concentration camps. The Bible could obviously be seen through her clothing, yet she was inspected and patted down like the rest before and after her. She risked everything to carry that precious treasure of the Word into one of the darkest places known to humanity. 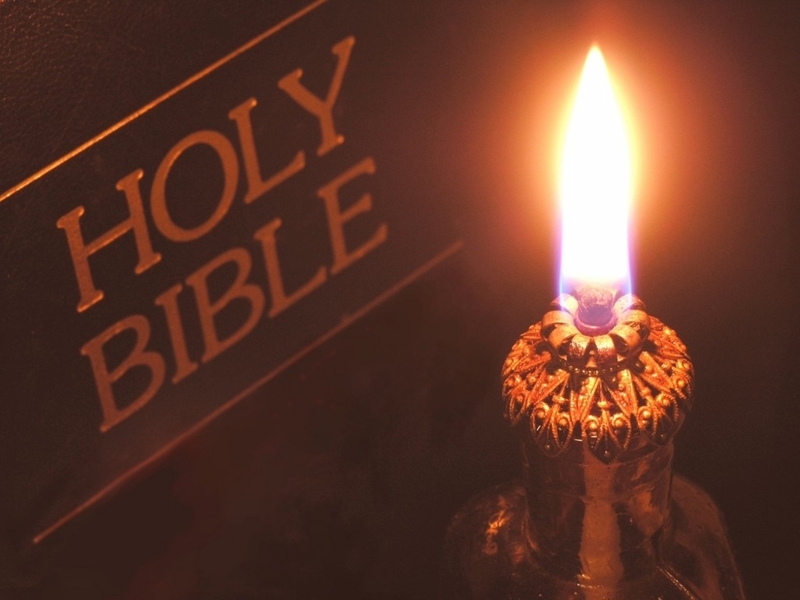 Because there is an indescribable value in the Word of God to them that believe and hold dear its truths. This really struck me this morning as I was reading in Psalm 119, NKJV. As a whole, this chapter speaks so much of the Word of God. It reminds of us of the importance and power of His Word and how we should not take it lightly. We should treasure it and hold on to it and let it lead and guide us every day. “Blessed are those who keep His testimonies, who seek Him with the whole heart!” (vs. 2). “You have commanded us to keep Your precepts diligently,” (vs. 4). “Oh, that my ways were directed to keep Your statutes,” (vs. 5). “Your word I have hidden in my heart, that I might not sin against You,” (vs. 11). “I have rejoiced in the way of Your testimonies, as much as in all riches,” (vs. 14). “My soul breaks with longing for Your judgments at all times,” (vs. 20). “Teach me, O LORD, the way of Your statutes, and I shall keep it to the end,” (vs. 33). “Make me walk in the path of Your commandments, for I delight in it,” (vs. 35). “Establish Your word to your servant, who is devoted to fearing You,” (vs. 38). “Behold, I long for Your precepts; revive me in Your righteousness,” (vs. 40). “Remember the word to Your servant, upon which You have caused me to hope,” (vs. 49). “Teach me good judgment and knowledge, for I believe Your commandments,” (vs. 66). “I know, O LORD, that Your judgments are right,” (vs. 75). “Forever, O LORD, Your word is settled in heaven,” (89). “Unless Your law had been my delight, I would have perished in my affliction,” (vs. 92). “You are my hiding place and shield; I hope in Your word,” (vs. 114). “Direct my steps by Your word,” (vs. 133). “Great peace have those who love Your law, and nothing causes them to stumble,” (vs. 165). These are just a very few of the many written within that psalm and just a few of the many that I have personally highlighted. What we read goes beyond just reading the word. In these verses we see a Relationship With The Word. Why was Corrie Ten Boom ready to sacrifice it all just to have a Bible in the prison camp with her. From a young age her father taught her how to have a relationship and a dependency upon the Word. It is as vital, if not more so, than anything else she could have smuggled in there. In a many of dark times, the Word is what shines a light brighter than any sun. In the Word we find comfort, solace and peace no matter the prisons that try to hold us. I urge you to reevaluate your Relationship With The Word today. Don’t look at it as something I have to get through because that’s what I am supposed to do. Read it, absorb it for the treasure that it is. “Open my eyes, that I may see wondrous things from Your law,” (vs. 18). “Revive me according to Your word,” (vs. 25). Let your relationship with the Word be renewed and revived today. “As my health returned, I was able to use my eyes longer. I had been sustaining myself from my Scriptures a verse at a time; now, like a starving man, I gulped entire Gospels at a reading, seeing whole the magnificent drama of salvation,” Corrie Ten Boom, The Hiding Place, p. 167, Hendrickson Publishers, Copyright 1971, 1984, 2006. When was the last time we starved to have a Relationship With The Word? Look at it as not a task that must be completed, but a source to be revered and treasured. As it did for Corrie, it will “sustain” you also. His Word does not fail! If you have never read The Hiding Place, I urge you to do so. I believe the lives and experiences written therein will inspire you in your Christian journey also. Here is this week’s lesson just in case you missed it’s earlier publication. Blessings! There’s a wonderful feeling of release that washes over you when you give God your distresses, woes, and worries in prayer. That feeling comes because we know He hears; we know that He is paying attention to our cries and He is not slack toward His people. It was one of those moments in prayer when you could utter no words, tearing streaming down your face, and only one phrase keeps repeating itself in the heart. That was me last night and try as I might to redirect my prayer, the Holy Spirit within me kept drawing me back to Psalm 118:5. I couldn’t get past it. After several attempts to lead my own prayer, I acquiesced. There had to be a reason why my heart stayed so solely on this one verse. Revelation struck in the midst, telling me that I needed to be reassured that God hears me. Sometimes the heart, as faithful as it can be, needs the additional support of knowing God hears. David was judged wrongly by those of his own house. When the prophet Samuel came to Jesse’s house to anoint a new king no one suspected that the little ruddy boy out in the fields was the one God had in mind. Even Samuel himself looked at the appearance of the other young men and thought that surely one of these was the one God was seeking after. 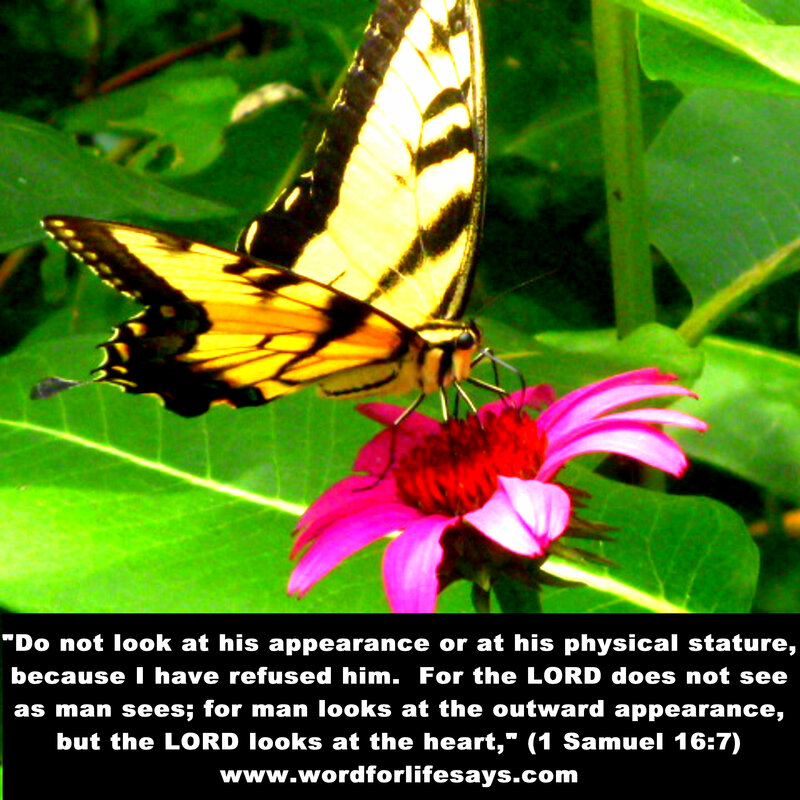 God plainly told Samuel, “Do not look at his appearance or at his physical stature, because I have refused him. For the Lord does not see as man sees; for man looks at the outward appearance, but the Lord looks at the heart,” (1 Samuel 16:7). In case you missed its earlier publication, here is this week’s lesson once again. Have a blessed weekend!